When was the last time a client asked you to design something for print? Did you feel comfortable meeting the request? There are a few key standards that you should understand to make the successful jump from online to printed design. When planning a print project you really have to take the medium, format and printing press in mind when putting together a project. It is also important to understand the differences in how color works, font embedding and other just preparing your flier, magazine cover or business card for print. 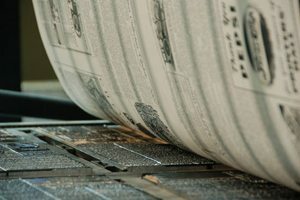 The first step in preparing for a print project is to know what you are printing on and what kind of press is printing it. Talk to your team members about these considerations and plan for the unexpected in advance. Determine what you will be printing on. Glossy paper, card stock, copy paper, newsprint? Each medium has a set of considerations of its own. Thinner paper types tend to have more bleed between the ink and paper, which can cause a degree of softness in images and text. Thicker paper types have far less bleed but can have a heaver ink lay, which can sometimes result in smudging because of the longer drying time. Every printing press can have its quirks as well. Look at other projects that have come from where yours will be printed. Note how the finished products look. Are certain colors heavier than others? How sharp is the registration? These are things you will want to account for in your design. Adobe InDesign is the preferred software for designing print materials from magazines and newspapers to brochures and leaflets to business cards. There are other applications that can do some of the same things as InDesign but this product has become the industry standard (the runner up is Quark). InDesign is specifically designed to create and prepare print projects for printing. You can create documents of any size and gain much more functionality when it comes to working with typography, as compared to the limited palettes in Photoshop. InDesign settings also make it easy for novice print designers to meet set specifications prior to publication. Successful printing can hinge on color selection and choices but even more important is accounting how print colors are created before they hit the press. Online, designers create each color using an RGB (red, green, blue) formula. This is the standard for how computer monitors display color. For print, presses use a combination of four colors, CMYK (cyan, magenta, yellow, black) to create each hue. Designers should create, or convert, all colors in their document according to where it will be published – online or in print. A layer of ink is put down in each color – cyan, magenta, yellow and black – to create everything on the page in process printing. That is why preparing colors based on the CYMK formula is so important. Black is also a consideration. You have three options when creating black for CMYK printing – rich black, four-color black and 100 percent black. Rich black should be used for large, solid areas on most printing presses. Rich black will give you a rich color and will not look gray, something that can happen with 100 percent black. Rich black can also be used for large type on presses with keen registration. Mix rich black as 30 percent cyan, 30 percent magenta, 30 percent yellow and 100 percent black (C30, M30, Y30, K100). True or 100 percent black results from printing using a single plate. True black should be used for small text, such as in magazines, books and newspapers because it eliminates registration concerns. True black, though, can have a washed out or gray look when used in large spaces. Four-color black also uses each of the printing plates and has an almost infinite number of color-mixing combinations. Four-color black is risky and should be avoided in most projects. Any mix of four-color black, including rich black, should not be used for text blocks. Any skew in registration can render the text unreadable. The biggest problem with fonts happens during the processing of files from your computer to the actual printing press. To ensure that fonts appear as designed, prepare your files for print by sending the fonts with the project or turning text into outlines. InDesign can help you send the fonts to the printer using the package or preflight options. This will create a folder that includes all of your original images and font files that can be submitted with the finished product file to a printer. One thing to keep in mind is the licensing regarding fonts when transmitting font files. You may consider having a written agreement with the printer that states all materials transmitted with your document are for use only for printing said document and must be deleted once the project is finished. Another option for font preparation is to turn text into outlines, which essentially turns each letter into an image. The major consideration is that text is no longer text and can’t be edited. Text that has been converted to outlines is perfectly compatible because the document no longer contains fonts. Most importantly, if you choose this option, keep two copies of your project – one with all of the fonts as fonts and another with fonts as outlines. If you don’t have the text version, a simple edit can result in hours of rework. Typically commercial printing jobs require image files to be submitted at 300 dpi (dots per inch) or greater. This is more than three times the resolution of standard web publication, which is 72 dpi. If a file is created at 72 dpi and stretched to the print specification of 300 dpi (or even higher) text and images will become blurry and pixelated, resulting in an unprofessional-looking final product. Always turn in a document that meets the specified size. If the project calls for an 8-inch by 11-inch flier, the document size should be just that. Files turned in at the wrong size can be rejected by the printer or resized in at the print facility. Resizing can result in a project with the wrong proportions or overall look. Bleed is the area at the outside edge of the document that allows for edge-to-edge design. The bleed will keep edges from being cut off and leaving white lines. As a general rule, extend your image 1/8 inch all the way around the outside margin of your document. Trim shows where a document will be cut off by the printer. This is generally the location of the page margin before any bleed. Safety is the area that is guaranteed to fall within the printing margins. While images can extend beyond the safety, relevant artwork and text should not to guarantee it is visible. Set the safety at 1/8 inch all around the inside margin of the trim. Preparing or converting a digital project for print takes some time and planning. A general understanding of the printing process can help you make your project more successful. Be aware of the differences in online and print publication. When preparing a project for print, talk to the printer to nail down specifications in advance and properly prepare your project for printing before it hits the press. Image Sources: “Peter”, Herkie and Thiemo Gillissen.